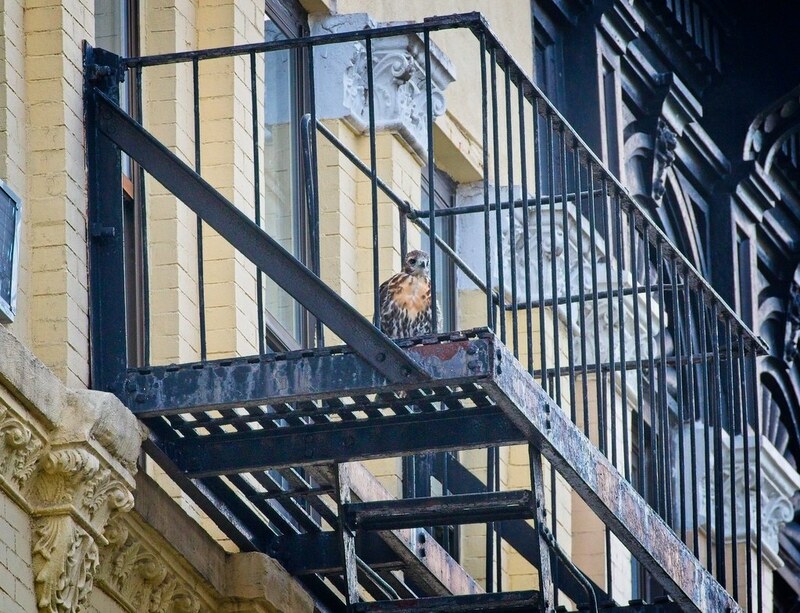 The younger of the two Tompkins Square Park hawklets fledged the nest at 2:02pm on Friday, July 13. 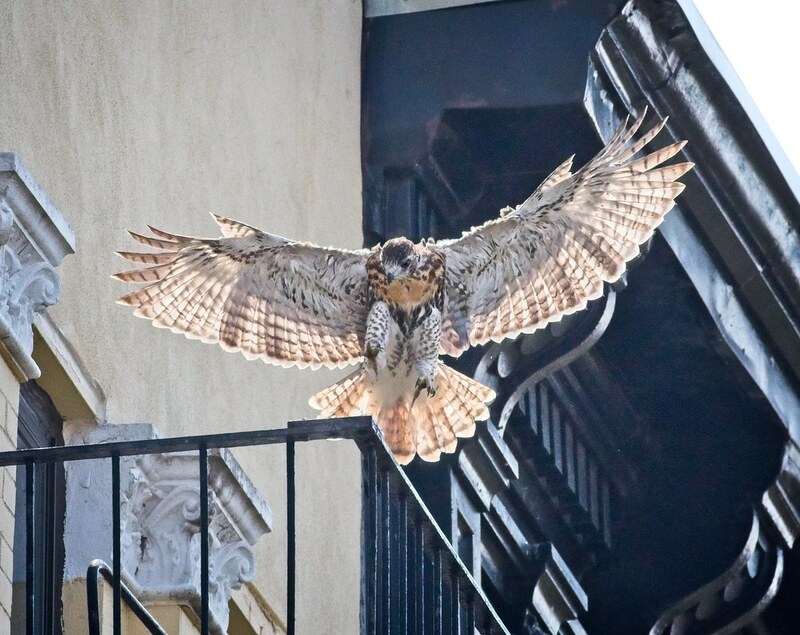 It spent the night on a fire escape on E 8th Street and I returned to the site at 7:45am on Saturday, hoping to catch the parents making a breakfast delivery. 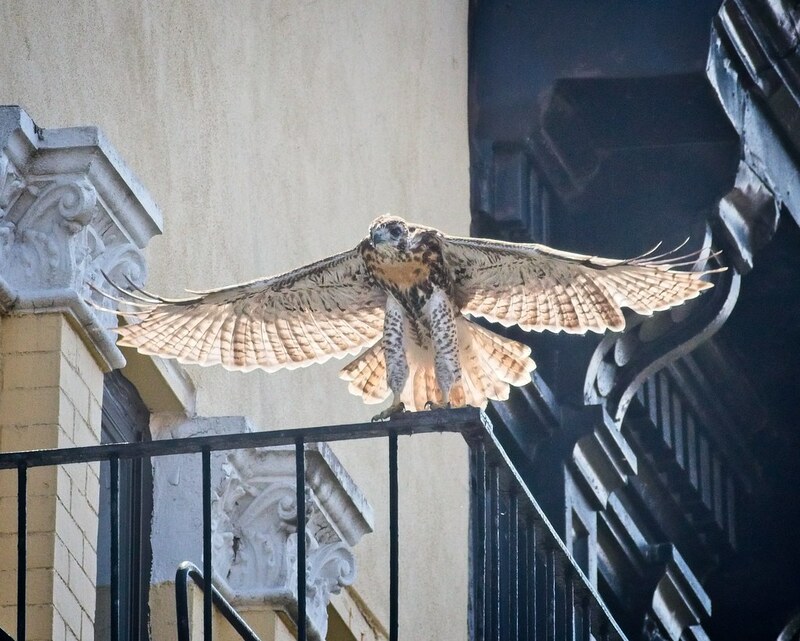 When I arrived, the fledgling was still on the platform of the fire escape, hopping back and forth over the opening for the ladder. 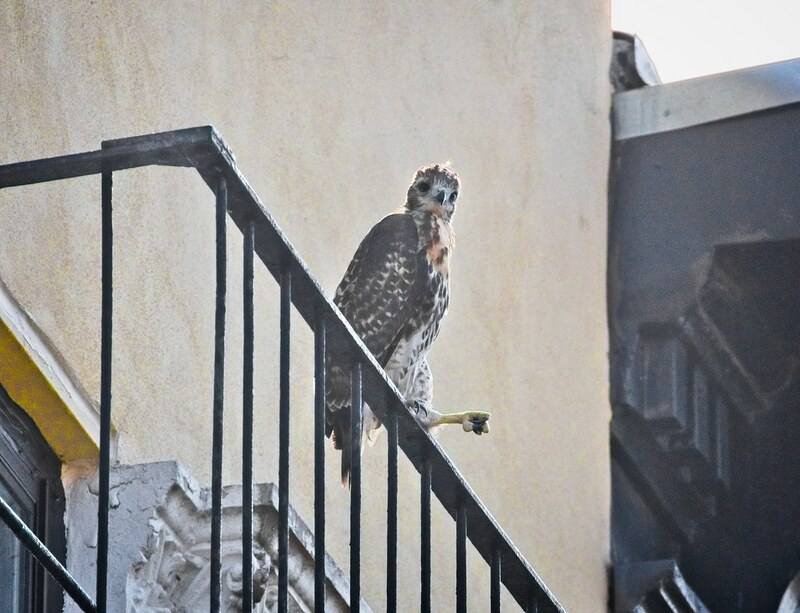 After an hour or so, the fledgling finally hopped up to the railing. In this more prominent position, the local mockingbirds had an easier time mobbing it. As did this angry female kestrel. 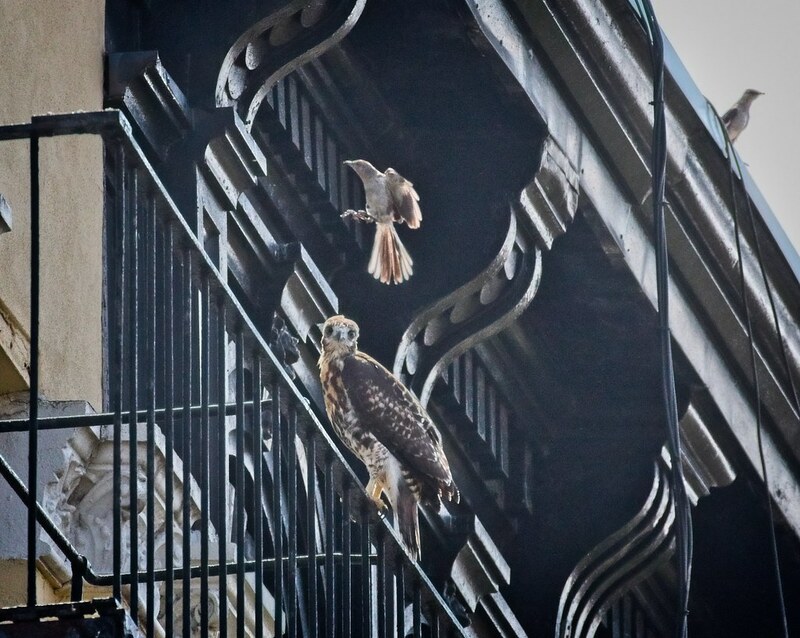 Blue jays, robins and even sparrows took their turns harassing the hawk. 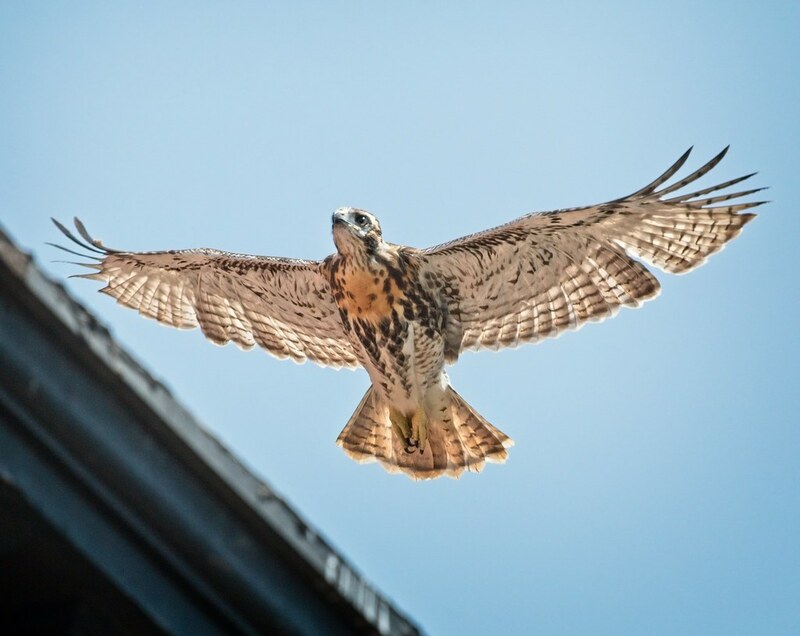 When this happened, mom Amelia would perch on the nearby cross at St Brigid's church, drawing the mobbers' attention away from the fledgling. 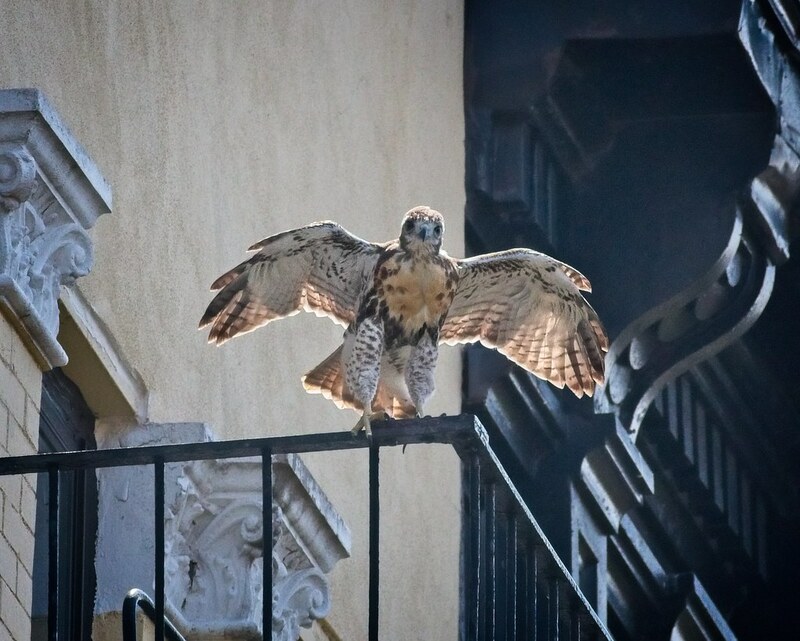 As the morning wore on, the fledgling practiced jumping and running along the fire escape railing. 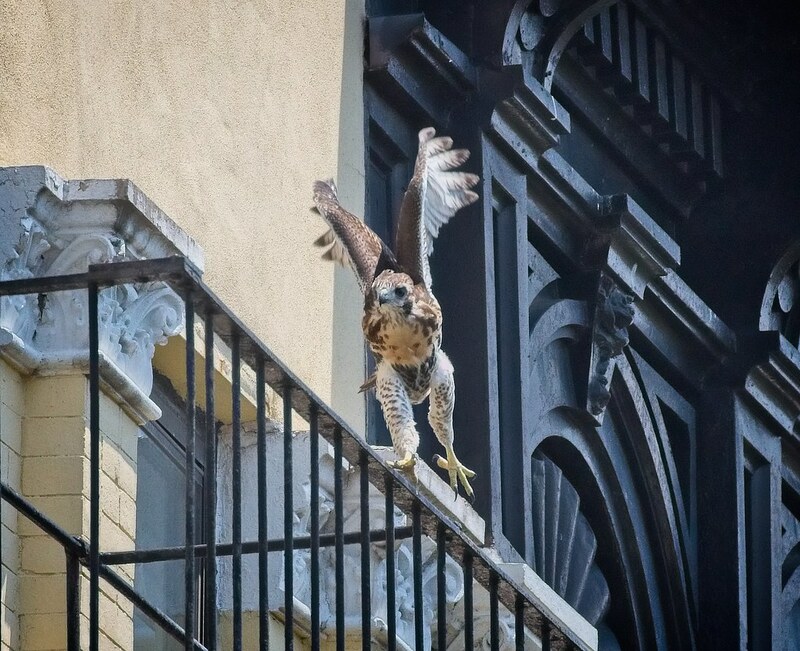 At 1:13pm, without having had any food deliveries from the parents, the fledgling decided to fly west on 8th Street, back to the park and into the nest tree. The flight was straight and level, very impressive! 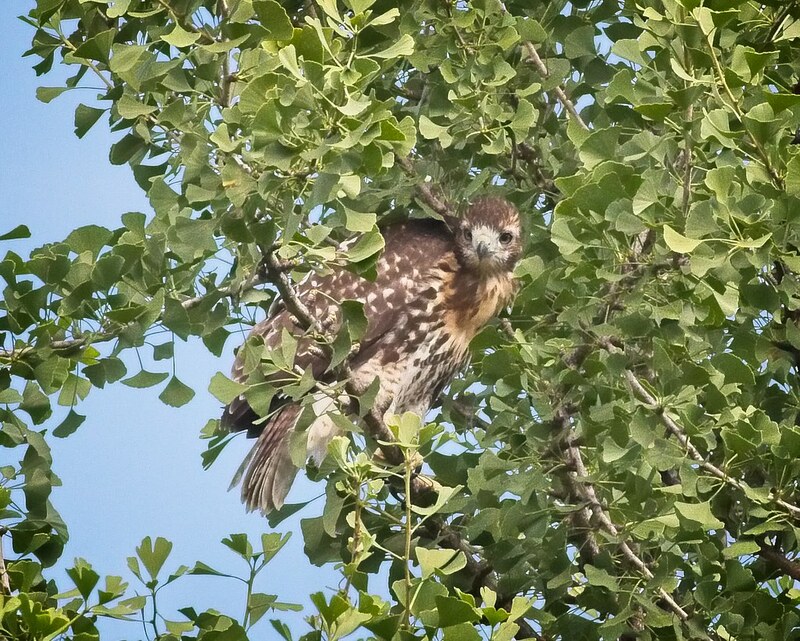 The hawk landed in the ginkgo tree, about 20 feet below the nest where its sibling perched. Both Christo and Amelia came to the nest to check on the kids. Below, the older sibling branches but still (as of July 15) has not taken flight. The young hawks spent the rest of the day at the nest. At 8pm, Christo made a dinner delivery. 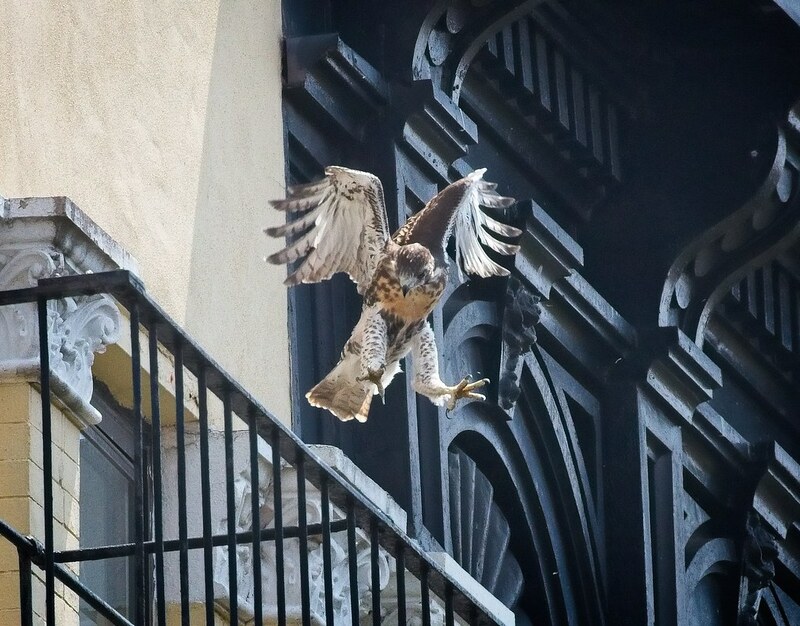 As far as I know, the fledgling had not been fed since it left the nest on Friday, which would have been 30 hours prior. It never cried for food and seemed to be just fine, so I trust the parents have everything under control. I spent this afternoon (Sunday, July 15) in the park and saw feedings take place at the nest. 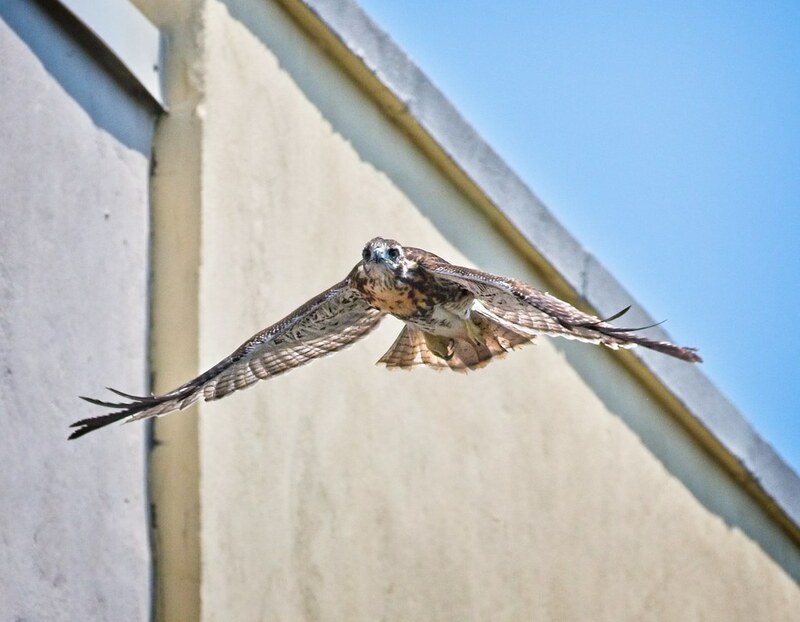 It could be the parents prefer to keep feeding the young hawks at the nest until the second one fledges. The fledgling spent a few hours in the high tree canopy near the Avenue B and 7th Street entrance of the park before flying back to the nest just before sunset. 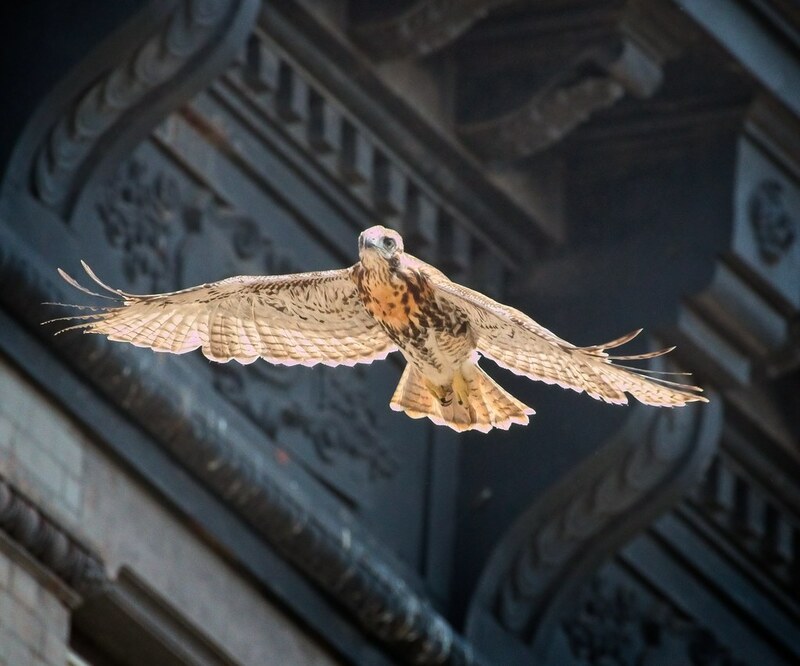 In the meantime, you can see many more recent hawk photos on my Flickr page.